ZAMBOANGA City is one of those areas in Mindanao that constantly gets a bad rap, and unfairly so. We are inundated by travel advisories by foreign embassies warning of the dangers of traveling to the region due to Muslim separatist rebels (or bandits), as well as election-related violence that seems to be erupting in several areas down South. Googling, in fact, turned up several questions from Filipinos and foreigners alike on whether it was safe to travel to Zamboanga City. In reality, however, the city is just as safe as heck, traveling around Metro Manila! 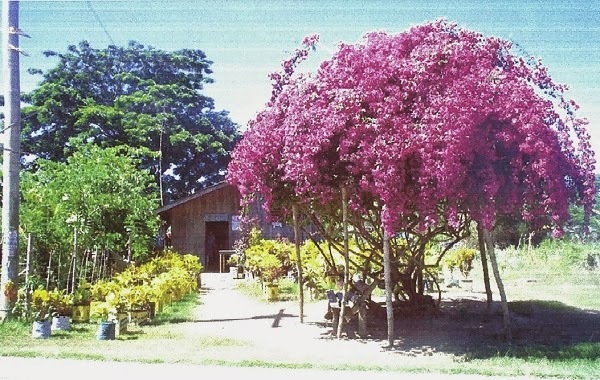 Dubbed the City of Flowers due to the profusion of colorful blooms grown in home gardens or in parks, Zamboanga City offers a rich cultural heritage of Spanish and American colonial influences, as well as touches of Muslim culture. Going to Zamboanga City is like traveling back in time. Chavacano, the dialect spoken there, is about 70 percent Spanish with some local native words mixed in. 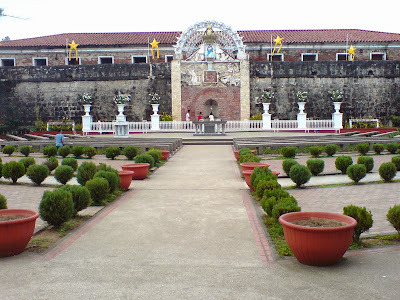 That, and most Zamboangueños’ devotion to the Church, are examples of the lasting influences of Spain, which made this city its southernmost outpost. It also has one of the few remaining examples of American colonial architecture, with such buildings still being used to this day. Fort Pilar was originally founded as a garrison in 1635 to defend the Spanish colonial government from attacks from Moro pirates and the forces of the Sultan of Sulu. Built from stone, the fort is now a museum featuring a permanent exhibit on marine life of Zamboanga, Basilan and Cebu. It also houses paintings, cultural artifacts from the tribes in Zamboanga and geological collection, among others. The fort is a peaceful place to visit with its well-manicured lawns and landscaped garden. It is also an outdoor shrine dedicated to Our Lady of the Pillar, which is said to be miraculous. One of the favorite American landmarks is the Pasonanca Park (Santa Maria Road) It was established by Gen. John “Black Jack” Pershing, once the governor of the Moro Province (and yes, after whom US ballistic missiles are named). It was said that he had a park expert actually come over from the United States, just to plan and design Pasonanca. It is one of the beautifully designed open spaces in the city. Check out the aviary and the Butterfly Sanctuary. Plaza Pershing, constructed to honor the general’s defeat of Muslim insurgents in his time, is also another place for tourists who just want to relax and commune with nature. During Christmas, the plaza hosts a giant Christmas tree and is festooned with multi-colored lights as the Zamboanga City Hall (Valderoza Street), which was also built during the American Occupation. The city hall stands out from the rest of the architecture in the area, being made from adobe stones topped by red terracotta roof. Inside is an antique chandelier with the city hall’s interiors all constructed from hardwood. The Western Mindanao State University (Normal Road) is also a fine example of American colonial architecture with its high ceilings and large windows. While the Metropolitan Cathedral of Immaculate Conception (La Purisima Street) is of modern design, it stands as one of the visually arresting symbols of Spain’s religious hold over the country. Shaped like a cross, the spacious cathedral has two chapels—one for daily Masses and the other for Sunday Masses, weddings and other religious celebrations. A marble statue of the Immaculate Conception sculpted by National Artist Napoleon Abueva stands in the main church. While off the usual tourist track, Rio Hondo, just northwest of the Santa Cruz Island ferry terminal, is another fascinating destination to explore. It is a Muslim village with houses and a mosque on stilts built over water. The labyrinthine inner passageways and paths can be confusing so it’s best to talk to members of local village councils to help take you around. The residents are actually warm and welcoming, and show visitors a more exotic side of the city. Fun in the sun and surf. The Great Santa Cruz Island with its unique pink-sand beach is quite a revelation. Now a marine sanctuary, there are huts that visitors can use for day trips of swimming and picnics. One must also try the local tour of a Badjao village. The island is accessible by outrigger or pump boat from the Lantaka Hotel just 10 minutes across. Trips are coordinated through the Department of Tourism desk there. 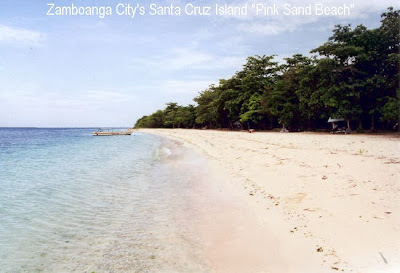 Because it is a coastal area, Zamboanga City hosts numerous often-unspoiled beaches such as Bolong Beach to the north, and the Eleven Islands with its powdery white-sand beaches. Day trips are recommended at the Eleven Islands as there are no facilities onsite for accommodations, food and showering. The area is popular for snorkeling and scuba-diving. Those in for some serious trekking and outdoor fun should visit Merloquet Falls (Barangay Sibulao), which is about two hours away from the city proper. It is a dramatic two-tier waterfall with a pool below to wade in. Visitors are not allowed to eat or drink there, as the local government tries to keep the area pristine. Snap up a bargain. The Yakan Weaving Center (National Highway) is a visual feast with its artistic handwoven textiles by the Yakans of Basilan. The women are eager to narrate the stories behind the design of the textile. Unfortunately, this is a dying industry and very few young Yakans take up the trade. The textiles they sell are less expensive than at the Barter center or souvenir shops. For batik textiles and products from Indonesia as well as Malaysia food delicacies, chocolates and coffee, drop by the Barter Trade Center (Barangay Canelar). Haggling is the order of the day, and one can often get a bargain for half the price initially quoted by the vendor. Go on a diet. A seafood diet, that is. Zamboanga has some of the most unusual and palate-pleasing seafood in the country. There, one finds the curacha, a spiny crab, that is the house specialty of Alavar’s (Don Alfaro Street, Tetuan)—one of the oldest and still popular seafood restaurants in the city—and cooked in a lip-smacking coconut and crab fat sauce. The Garden Orchid Hotel (Gov. Camins Avenue/http://www.gardenorchidhotel.com/) is the most popular in the city. It is close to the airport and has a new 10-story wing with almost five-star hotel amenities. Service can be spotty, but overall, it offers excellent value for money, with its spacious rooms that are comparable to a number of Metro Manila hotels. For those on a shoestring budget, CA Atilano Pension House (Km 4, corner Toribio Drive, Pasonanca (T# 062-985-1801/926-2761/0919-4357819) is a good choice. The rooms are air-conditioned, with hot and cold shower. The property itself is very clean and quite near a lot of food stalls and eateries. Most major airlines fly to Zamboanga from Manila or Cebu. Want to know more about Zamboanga City? Drop by or call the Department of Tourism, Region 9 office, at Valderrosa Street, Zamboanga City (T# 062-992-6242/993-0030). Sorry I've been remiss in posting!